The bestselling author of Message in a Bottle and The Notebook returns with a deeply moving tale of first love and its transformational powers. "When I was seventeen, my life changed forever"... So begins Nicholas Sparks' touching tale of Landon Carter, a teenage boy living in the small town of Beaufort, North Carolina in the late 1950s. Landon is a typical teenager who just wants to have a fun senior year before heading off to college. The last thing he anticipated is Jamie Sullivan, the sweet, pious daughter of the town's Baptist minister. But on the evening of Beaufort's annual Christmas pageant, Landon will undergo a change of heart that will forever alter the course of his life. In the months that follow, Landon discovers truths that it takes most people a lifetime to learn- truths about the nature of beauty, the joy of giving, the pain of loss, and, most of all, the transformational power of love. Nicholas Sparks' most recent novel, Message in a Bottle has nearly 700,000 hardcover copies in print and was on the New York Times hardcover bestseller list for 28 weeks. The Warner paperback edition has over 1.5 million copies in print. In spring 1999, it was released as a major motion picture starring Kevin Costner, Robin Wright Penn and Paul Newman. 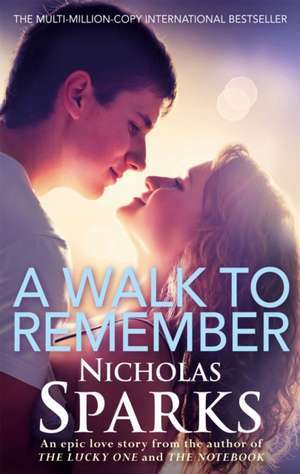 A New York Times hardcover bestseller for 56 weeks and a paperback bestseller for well over a year, Nicholas Sparks' first novel, The Notebook (1996) has nearly three million hardcover and paperback copies in print combined.